I found these five Nepalese carved clay Buddha Pendants in Nepal two years ago and was really drawn to creating a piece with them. Looking through my extensive collection of beads I was delighted with how well the necklace worked with old clay and shell beads. The antique conch shell barrels are particularly beautiful with a wonderful smooth feel and the six vintage Dogon West African burial clay beads really bring the piece together. Some of these shell and clay beads have small chips and dents but add to the beauty of the piece rather than detract. 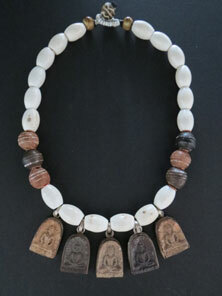 Finished with a button clasp of tiny Masaai beads and an old fossilised stone bead.